The BP tanker Torrey Canyon ran aground March 18, 1967 on reefs offshore Cornwall in Great Britain. It transported 120,000 of crude oil. Several Breton fishing ships were eyewitnesses to the crash course of the Torrey Canyon. The majority of the oil slick headed toward the French coast and has left its tracks between Cherbourg and l’île d’Yeu. Northern Brittany was very severely affected. The oil spill has been attacked with detergents. 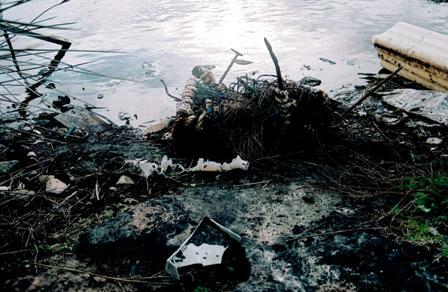 The Defense Ministry organized the battle, the waste being treated as an enemy. On l’île d’Er (Enez Ter’ch), a small archipelago of 40 hectares in size, 4 trenches were dug by the military on requisitioned private lands. 3 of them were filled. They are behind the shingle bar that separates the island from the sea. They stayed 44 years under the open sky. They are nourished by the rainwater, sprays, tempests, and the spring tide. They expose the fauna and the casual stroller to the risk of falling. Oyster farming activities are developed on the foreshore that separates the island from the continent. 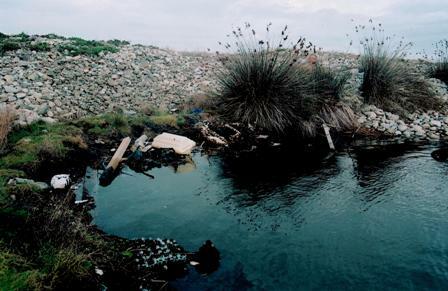 Following renewed appeals from Robin des Bois, the French Ministry of Ecology took the impetus from its bureau of polluted sites to extract the waste and return l’île d’Er to its natural and preserved character. 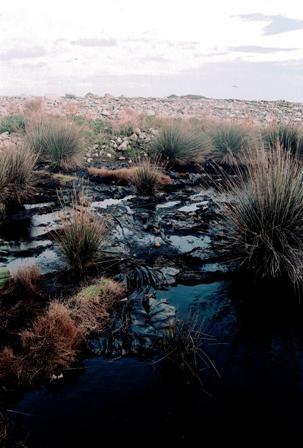 Robin des Bois, since the sinking of the Erika in December 1999, has encouraged the Ministry of Ecology and the local authorities to re-examine the historic stockpiling sites of waste from oil slicks, at the forefront of which are the Torrey Canyon (1967), the Amoco Cadiz (1978), and the Tanio (1980). In this perspective, l’île d’Er was the priority. The volume of waste to extract is estimated between 400 and 600 tons. To avoid rolling out heavy equipment on the island, which would have degraded the flora and the foot trails, airlifting the waste between the insular trenches and the continent (the commune of Plougrescant, Côtes d’Armor) was preferred. Access to the island by any heavy nautical means is difficult. The total budget of the operation could reach one million euros. The work has begun and must be finished before the end of the year. The waste will be treated in a specialized incinerator for dangerous material close to Havre. The oil spill clean-up on l’île d’Er, on the condition that is carried out correctly, is for Robin des Bois a spectacular advance, which testifies to the engagement of the Ministry of Ecology to repair the errors of the past, and supervise the administration of waste after a catastrophe.